Show Me The Movies: Star Wars: The Last Jedi - The force is still strong in this well loved series! Star Wars: The Last Jedi - The force is still strong in this well loved series! In Star Wars: The Last Jedi, Rey develops her newly discovered abilities with the help of Luke Skywalker, who is unsettled by the strength of her powers. Meanwhile, the Resistance prepares to do battle with the First Order. With the fine job done by J.J. Abrams on resurrecting this ever popular franchise and with the highly talented Rian Johnson (Looper) taking on both writing and directing roles to say that Star Wars: The Last Jedi was eagerly anticipated would be perhaps one of the cinematic understatements of the year! The return of old favourites such as Luke Skywalker, Princess Leia and Chewbacca with the excellent newer additions to the series like Rey, Finn and Po with the added promise of more detailed and prolonged shots and running time dedicated to Skellig Michael this time around and it's perfectly natural that all cinema goers would be joyously heading to the local Omniplex full of hope for what had to potential to be another action packed adventure between the Dark Force and the Resistance. The good news for all Star Wars fans is that this second installment in this reboot is full of quality, immersed in all that has made the Star Wars comeback a resounding success. Fantastic creatures, stunning set pieces, strong characters and a plot that engages and keeps it's audience guessing right up to the last shot are all present here. The seamless transition from the old to the new is again present in this film with Johnson (like his predecessor Abrhams) marrying the best of the iconic classics with a fresher perspective to outstanding effect. The Last Jedi may not have the novelty effect of the Force Awakens but there is much more occurring plot wise in this second episode and more compelling twists and turns on show. 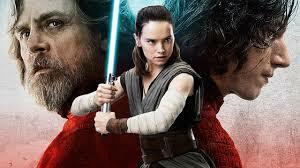 It may be slightly long at a running time of two and a half hours but that will not bother Star Wars fans as The Last Jedi sits quite comfortably as the meat in this particular blockbuster series sandwich with the promise of more excitement to come. The force is strong with this one! Over 20,000 hits and counting!